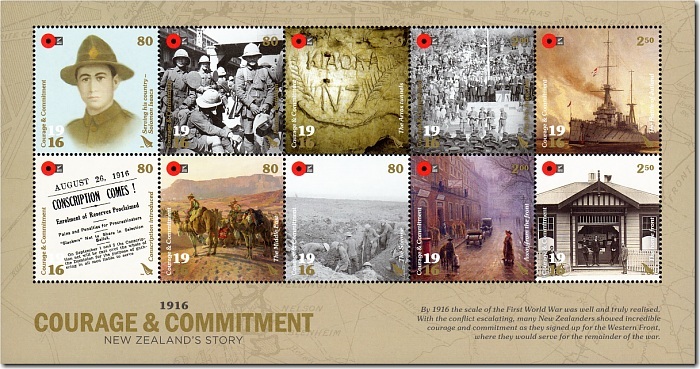 Virtual New Zealand Stamps: 2018 World War I Commemorative Book Series. 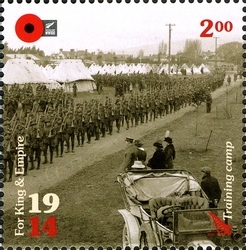 "100 years ago, the shape of New Zealand began to change forever, as we followed King and Empire to serve in the First World War. What was meant to be a ‘great adventure’, soon affected every New Zealander at home and abroad, with 18,500 New Zealanders never to return. 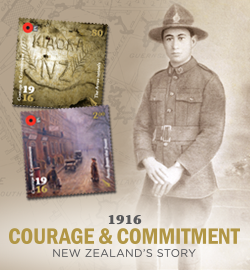 To commemorate this important centenary and honour those who served, New Zealand Post is issuing official stamps and legal tender commemorative coins." That was the opening statement for this series of issues from the NZ Post website. This was the beginning of a complex series of issues spread over five years. 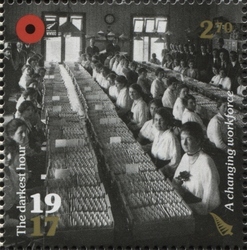 Each year a collector book was produced to go with the stamps and tell the story behind the New Zealander featured each year. Five books together with their collector bookcase. 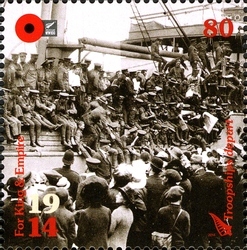 2014 World War One Commemorative Issue. 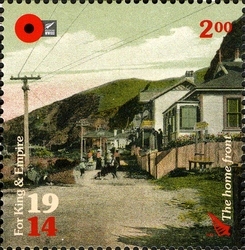 For King & Empire - 1914. 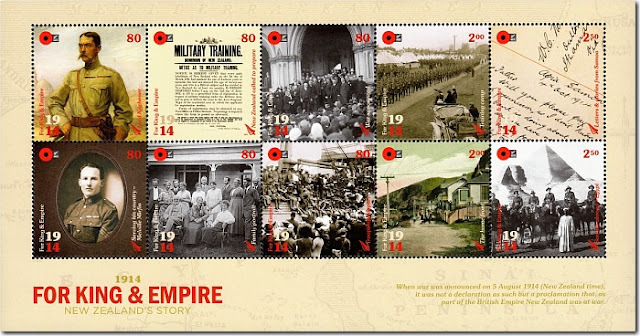 See our post: - 2014 For King & Empire - 1914. 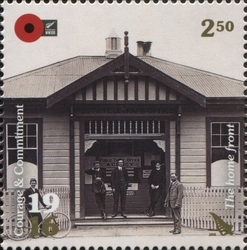 While it is impossible to tell every individual story of WWI, as part of each stamp issue over the five years the wider story of the war was shown through the eyes of an everyday New Zealander. In 2014 it was the story of Melville Mirfin. Like thousands of others, Melville Mirfin left his family behind and answered the call to defend King and Empire. But unlike so many of them, he not only survived the War, he survived action from one end of the war to the other, and until now his story has remained untold. 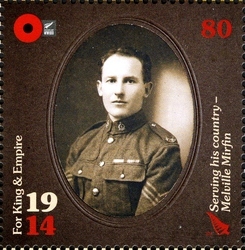 Born at Ikamatua on the West Coast of the South Island, Melville Mirfin spent 4 years and 359 days overseas. 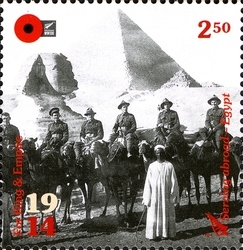 His postings ranged from Samoa in 1914 to Egypt in 1915, the Balkans in 1915, Egypt in 1916, the Western Front from 1916 to 1918 and finally the occupation of Germany in 1919. 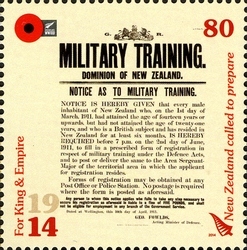 Outside of the officer corps, he must have been one of the longest-serving New Zealand soldiers during World War 1. A suitcase belonging to Melville, containing letters, postcards and photos of his time overseas has been passed down and cared for by the Mirfin family for 100 years. 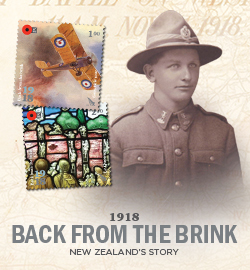 When Melville returned to New Zealand many people gave him back the letters he had written them and these were also stored in the suitcase - giving a very clear and detailed account of what he experienced between 1914 and 1919. For King & Empire - Miniature Sheet. 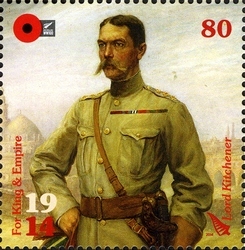 80c - Lord Kitchener. 80c - New Zealand Called to Prepare. $2.00 - Training Camp. 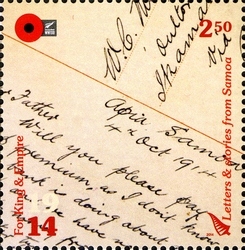 $2.50 - Letters and Stories from Samoa. 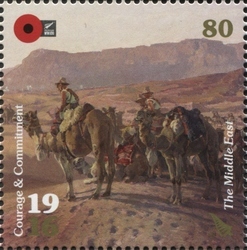 80c -Serving his country / Melville Mirfin. 80c - Mirfin Family Portrait. $2.00 - The Home Front. $2.50 - Serving Abroad / Egypt. 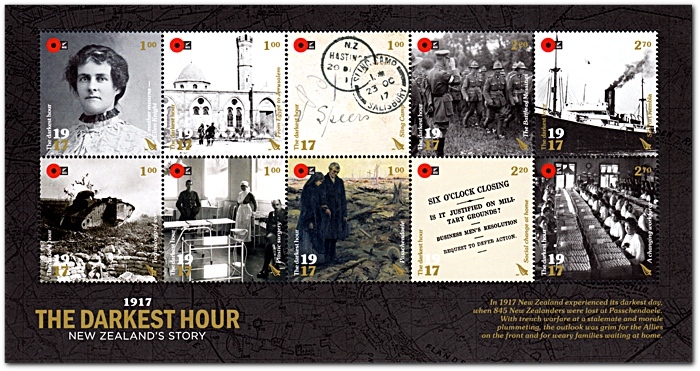 2015 World War One Commemorative Issue. 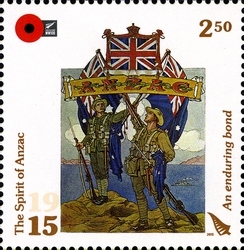 The Spirit Of ANZAC - 1915. 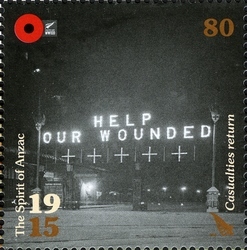 See our post: - 2015 The Spirit of ANZAC - 1915. 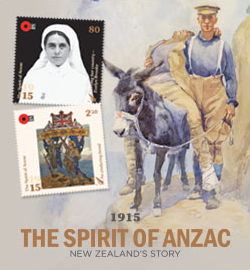 In 2015 the story of Evelyn Brooke was told, a nursing matron from New Plymouth. 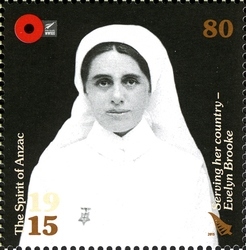 Known mostly as Eva and sometimes as ‘Brookie’, Evelyn was the only New Zealand nurse to be awarded the Royal Red Cross and Bar (the equivalent of winning a second Royal Red Cross distinct from the first) for her services during the First World War. Evelyn Gertrude Brooke was born in New Plymouth on 13 September 1879 to her father Thomas, a carpenter, and her mother Kate. 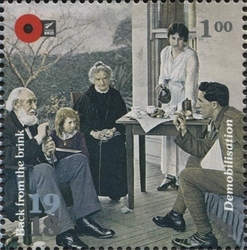 Thomas died 12 years later and Eva moved to Wellington with her mother soon after. 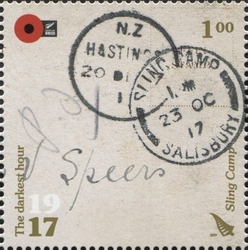 She chose a career in nursing and completed her nursing training at Wellington Hospital in 1907. 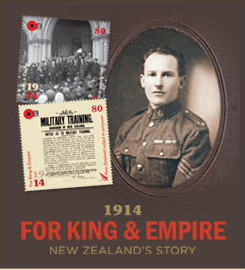 When war broke out Evelyn joined the Samoan Expeditionary Force to German Samoa in August 1914. Within a year she was promoted to the position of matron in the New Zealand Army Nursing Service (NZANS). 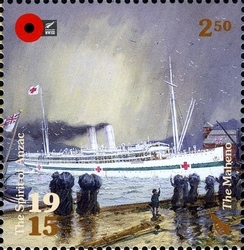 She embarked for Egypt on the hospital ship Maheno in July 1915 and made several trips to Anzac Cove between August and November. 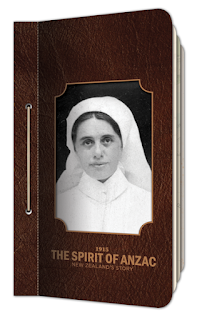 In 1916 she arrived back in New Zealand in 1916 where she was appointed matron of the Trentham military hospital. 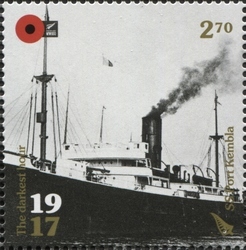 For the remainder of the war, she was stationed in both England and France before returning to New Zealand in 1919. 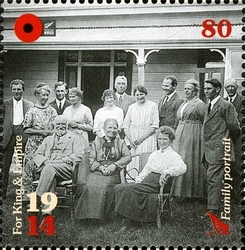 Evelyn Gertrude Brooke died in Wellington on 11 February 1962. 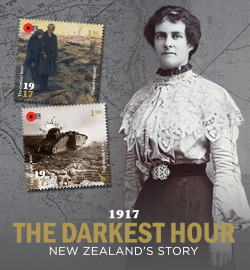 Today, 100 years on from her service at Anzac Cove, we can recognise her as a truly great New Zealander and as a humble woman who was, as she once said, “very pleased to be able to help”. 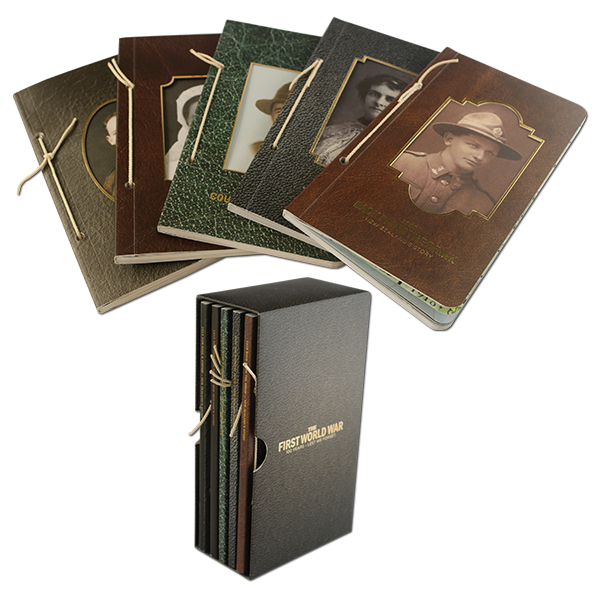 Evelyn Brooke’s extended family kept her belongings from the First World War in excellent condition, imagery of which is included in this year’s special commemorative book - including the autograph book she carried with her throughout the war, her certificate of service and the medals she was awarded for her service. 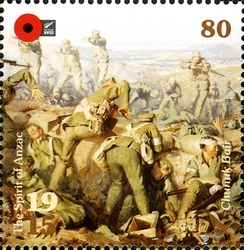 The Spirit of ANZAC Miniature Sheet. 80c - Evelyn Brooke / Serving her Country. 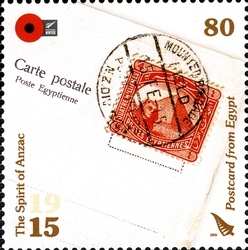 80c - Postcard from Egypt. 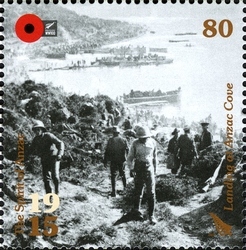 80c - Landing at Anzac Cove. 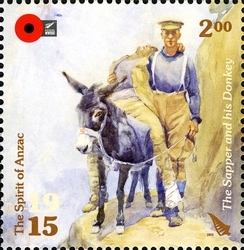 $2.00 - The Sapper and his Donkey. $2.50 - The Maheno / Hospital Ship. 80c - Chunuk Bair / Painting by Ion Brown. 80c - Casualties Return / Fundraising. 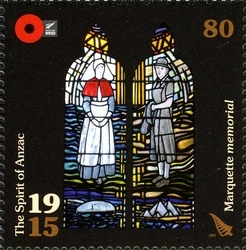 80c - Marquette Memorial / Christchurch Hospital Chapel. 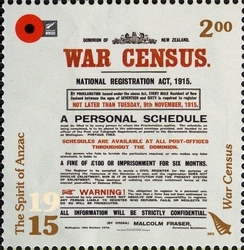 $2.00 - War Census Poster. $2.50 - An Enduring Bond. 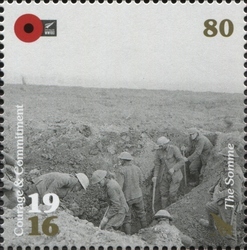 2016 World War One Commemorative Issue. 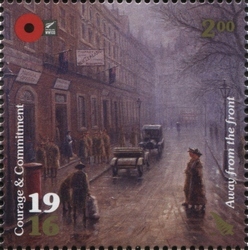 Courage & Commitment - 1916. See our post: - 2016 - Courage & Commitment - 1916. 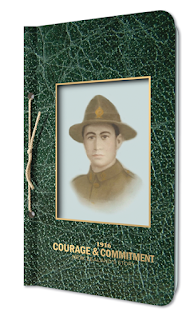 The 2016 issue told the story of Cook Islander Solomon Isaacs, who showed incredible courage and commitment during his three years of service fighting for his adopted country and the British Empire. Solomon Isaacs was raised in the village of Tautu on Aitutaki in the Cook Islands before moving to Auckland. Solomon worked in Northcote as a labourer and was just one of four Pacific Islanders who lived in New Zealand before volunteering. When war broke out, Solomon left New Zealand in February with the 3rd Maori Reinforcements, made up of Maori and Pacific Islanders. 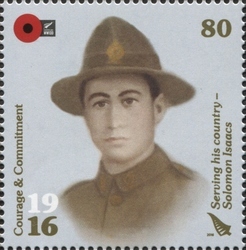 Solomon had been in Egypt with the New Zealand Pioneer Battalion just two weeks when orders came in April to leave for the Western Front. Here, during difficult, dangerous labouring work, Solomon saw fellow Pioneers felled by artillery and sniper fire. When the Pioneers took part in raids, Solomon was armed with hand grenades as a company bomber. On top of the day-to-day hardships and danger, Solomon struggled with the stodgy rations and the terrible cold. During his service, Solomon fell ill several times. 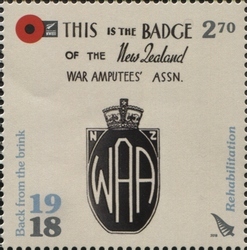 After recovering from Trench Fever, he was temporarily attached to the New Zealand Tunneling Company. For nearly three months, Solomon helped dig an underground-cavern system underneath the town of Arras, pausing to carve his name and the date (24/2/17) onto a tunnel wall. 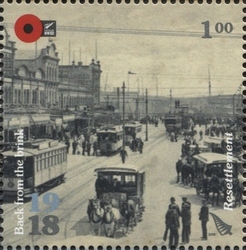 After the armistice, he sailed for New Zealand, living in Grey Lynn, Auckland for several years before returning to Tautu. He married in August 1922. When his son was one, Solomon went fishing alone in a remote lagoon for seafood that would fortify his wife’s breast milk. Sadly, Solomon stood on a stonefish and died shortly afterwards on 3 September 1923, aged 27. Solomon is buried alongside his parents between family homes in Tautu. 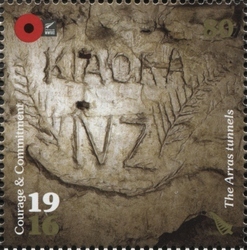 A concrete headstone bears his name, the words Great War Veteran, the New Zealand Expeditionary Force cross, and a silver fern. 80c - Serving his country - Solomon Isaacs. 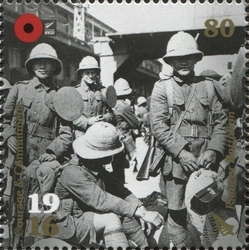 80c - The Pioneer Battalion. 80c - The Arras tunnels. 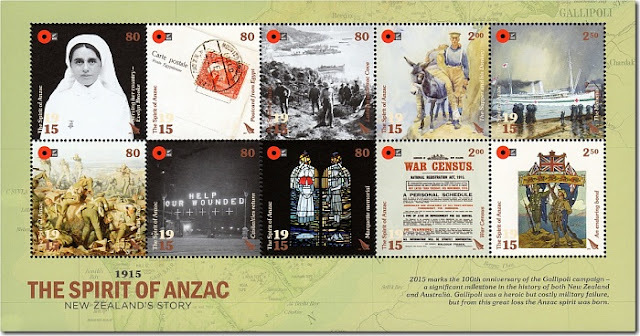 $2.00 - The first Anzac Day. 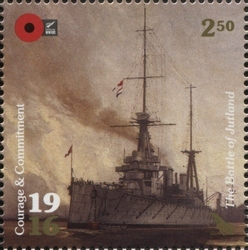 $2.50 - The Battle of Jutland. 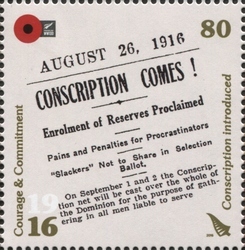 80c - Conscription. 80c - The Middle East. $2.00 - Away from the front. $2.50 - The home front. 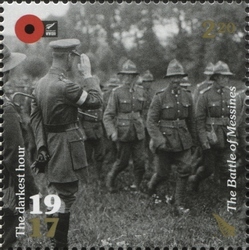 2017 World War One Commemorative Issue. 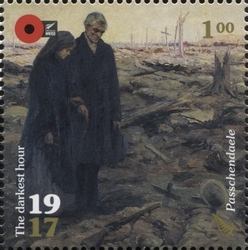 The Darkest Hour - 1917. See our post: - 2017 - The Darkest Hour - 1917. 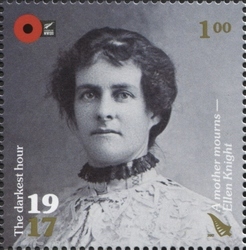 Ellen Knight, the mother of ten, lived in Dannevirke, while husband Herbert helped their eldest son Douglas at his farm between Whakatāne and Ōpōtiki. Farm workers were exempt from going to war, but George and younger brother Herbert enlisted to do their bit and sailed in February 1915 for Egypt, then on to Gallipoli. 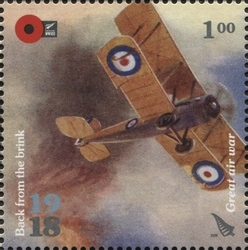 George regularly wrote to his mother, ensuring that he and his brother would stick together and come home safe. However, on 8 May 1915 the young, boisterous Herbert was shot dead by a sniper at Cape Helles after volunteering to bury a mule. George wrote to break the news, but Ellen had seen the casualty list before George’s letter arrived. 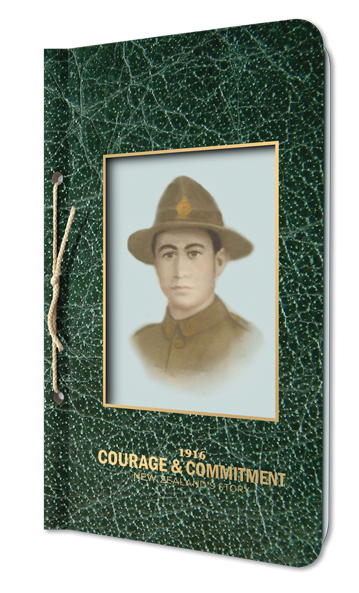 The light-hearted, lovable George had scares – surviving a shoulder wound, illnesses, a septic finger – before he was tragically shot dead at Passchendaele on New Zealand’s darkest day, 12 October 1917. Before the family found out about George’s tragic end, Ellen’s eldest son William sailed from Wellington, having been excused from the farm. 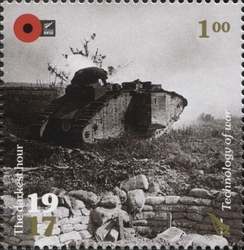 On 1 September 1918 Douglas was killed during the Bancourt Ridge offensive, felled by a shell while returning with an arm wound. 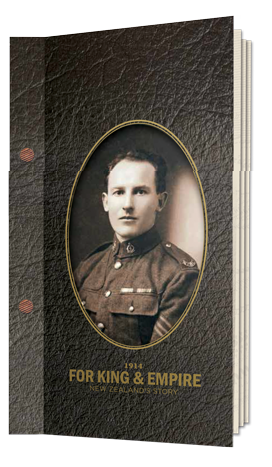 Thankfully Ken, who turned 18 in 1917, was never called up and took over Douglas’s farm. But daughter Margarette was struck by rheumatoid arthritis in 1918, and her mother became her caregiver. The next war also took its toll on Ellen and her remaining children. Her youngest, Maurice, died aged 36 while training troops in India in 1944. With her eyesight declining, she moved in with daughter Dorothy in Gisborne aged 87, then to a Whakatāne nursing home. When Ellen died aged 93, her family found the shoebox full of letters. 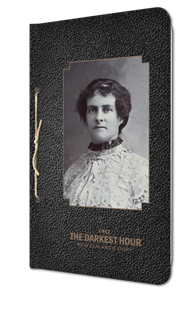 It’s through these letters and interviews with family members that Ellen’s story and that of her children is told in 1917 The Darkest Hour. 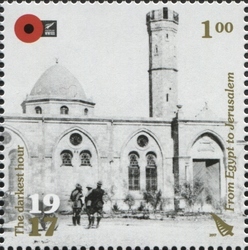 $1.00 - From Egypt to Jerusalem. $1.00 - Sling Camp. 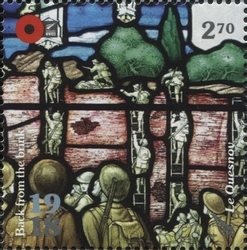 $2.20 - The Battle of Messines. $2.70 - SS Port Kembla. $1.00 - Technology of war. $1.00 - Plastic surgery. $2.20 - Social change at home. $2.70 - A changing workforce. 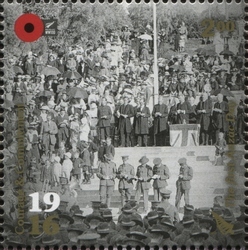 2018 World War One Commemorative Issue. 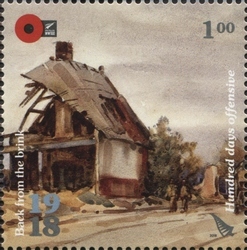 Back From the Brink - 1918. 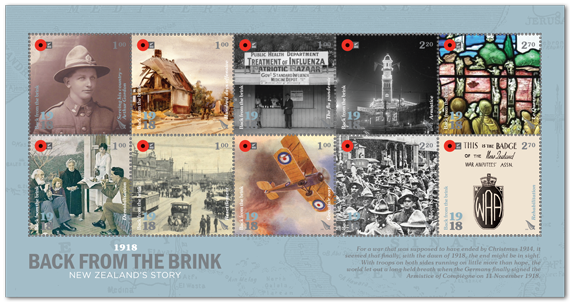 See our post: - 2018 - Back From the Brink - 1918. 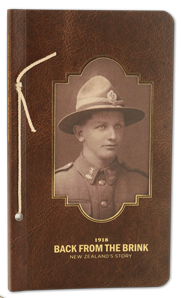 The Hundred Days Offensive was to be life-changing for Private Arthur Gordon of Tapanui, West Otago. Having enlisted in 1916 and miraculously survived many months of the war without physical injury, he was downed by an enemy shell on 31 August 1918. 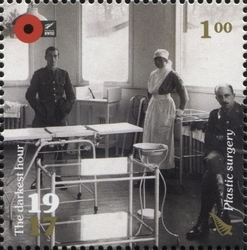 Severely wounded in his lower legs, left forearm and neck, Arthur was shipped to a hospital at Walton-on-Thames in England, where one leg was amputated above and one below the knee. During his recovery, he slowly learned to walk with the help of a stick – a situation that caused him pain for the rest of his life. Arthur finally made it to the new family farm at Heriot in February 1920. However, he was unable to farm, so like many of his compatriots and with government support, he chose another profession, retraining as a draughtsman. He also became a passionate advocate for disabled soldiers and a lobbyist to the Government, seeking improvements in everything from the quality of artificial limbs to the rules for war pensions. 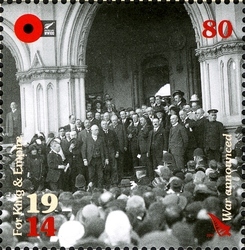 Better quality stamps to come when sharper images become available. 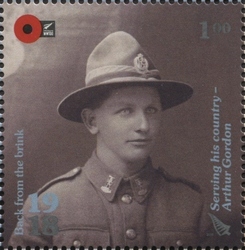 $1.00 - Serving his country - Arthur Gordon. $1.00 - Hundred days offensive. 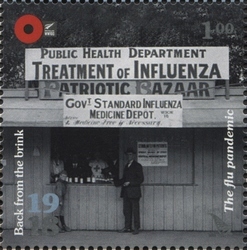 $1.00 - The flu pandemic. 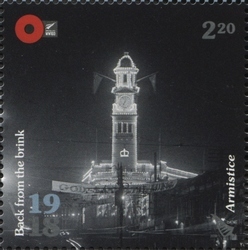 $2.20 - Armistice. $2.70 - Le Quesnoy. $1.00 - Resettlement. $1.00 - Great Air War. 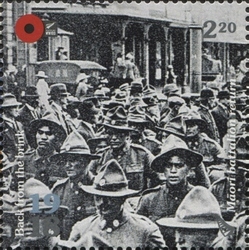 $2.20 - Maori Battalion return. $2.70 - Rehabilitation. Five years, five sets of stamps, five stories to tell in five books. 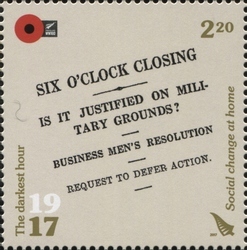 Suddenly these stamp issues came together for me when I saw this post. Moa.